Nick has already gone to school. Lisa, off to work. Maggie still asleep upstairs. And it’s almost time to get Gavin, my middle schooler, out the door. Not a problem usually, as he’s pathologically punctual, like his father. I walk into the mud room by the side door, where we hang coats and backpacks and shelve our shoes (in theory!). Clang, bang, clang! 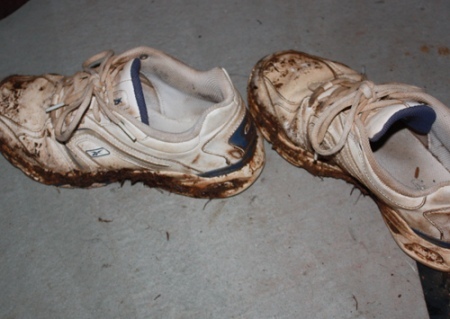 Gavin is slamming together the soles of his Reeboks, mud flying everywhere in caked clumps. To be clear: He is inside the house as he does this. And my son is doing it out of the goodness of his dutiful heart, since we’ve recently disparaged the trail of mud inside the house, through the halls, into the kitchen, across the rug. Yesterday I went so far as to hand my put-upon son a broom and dustpan, compelled him to sweep and other hideous punishments. So watching him bang the sneakers together, I recognize it as some form of progess. “Gavin, you do that outside,” I said. Maybe with a little something in my voice that conveys a hint of, just possibly, frustration. “But Dad, it’s the mud room,” he replied. I let that sink in for a moment, admire the logic of it. The mud room. Maybe not the best name in the world. In Gavin’s mind, a room dedicated to the accumulation of mud. There should be mud, in fact. And, in fact, he was doing a swell thing. Helping the cause! A good boy. So he instantly steps into the wet driveway in his white socks and starts to whack away. I almost talk about the wet ground and the white socks and how maybe that’s not the best combination in the world. How it’s possible to stand just inside and kind of lean out the door when whacking said sneakers. But decide against it. We’re moving in the right direction, one soggy step at a time.